In some countries, you’ll spend more than the original showroom price to get your hands on a mint condition 950 SE. So it’s not surprising we don’t see many custom versions. This one comes from the Sport-Evolution garage in Koblenz, Germany. 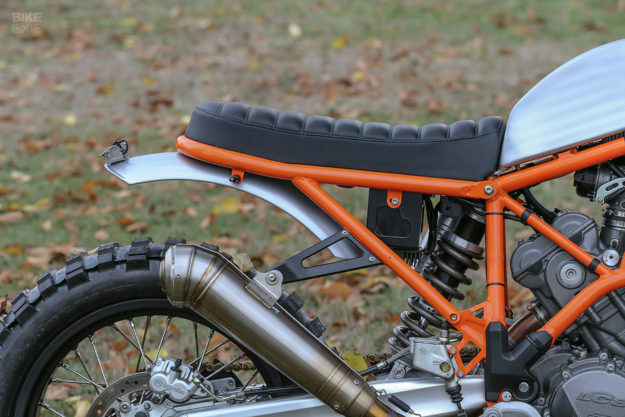 Former racer and engineer Dietmar Franzen normally works on cafe racers, scramblers and bobbers—with a particular leaning towards classic two-valve BMW engines. He even manufactures his own TÜV-approved custom parts. Dietmar decided to make the most of the compact tubular frame and engine, rather than hiding the engineering tour-de-force with meters of plastic. 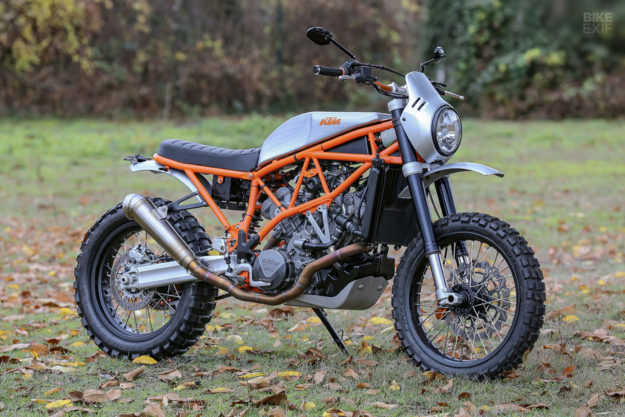 With the substantial plastics and long seat gone, the KTM immediately lost a ton of weight—both real and visual. 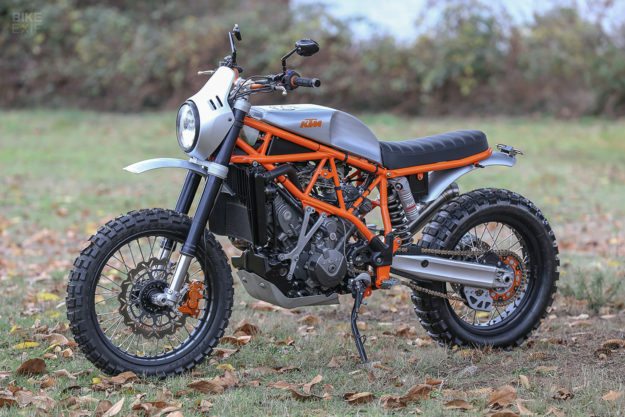 The Sport-Evolution crew fabricated and bolted on a stubby new subframe and seat, and built a new box to suspend the battery under the seat base. 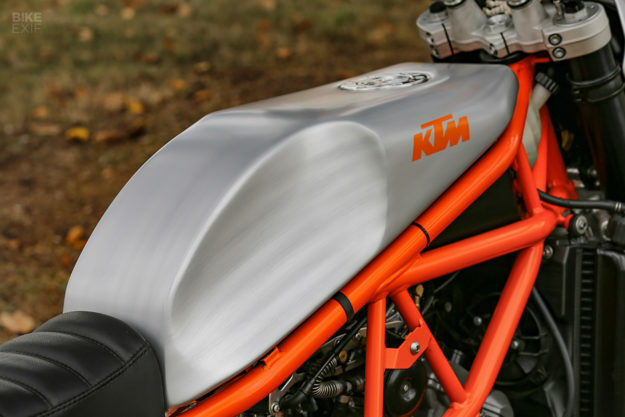 The scalloped fuel tank is an immaculate fit on the iconic orange frame. 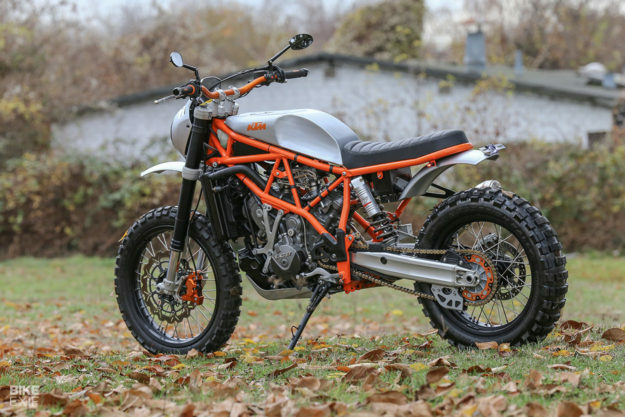 Sitting like a cap on the top tubes, it’s hardly a high capacity unit—but the Super Enduro itself was not renowned for its range, with only 14 liters in the original tank. Hand-made fenders front and rear match the raw aluminum finish of the tank, and if that fairing looks familiar to you, you’ve got sharp eyes: it’s from a BMW R nineT Urban G/S. A Motogadget speedo hides right behind, hooked up to a stripped down wiring harness. There are new, lightweight aluminum wheels: the rear stays at 18” but the front drops a couple of sizes to a more street-friendly 19”. 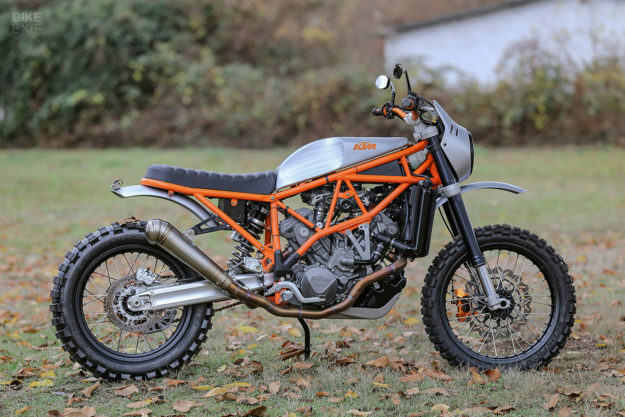 The tires are Pirelli’s tough, Dakar-winning Scorpion Rally compound. 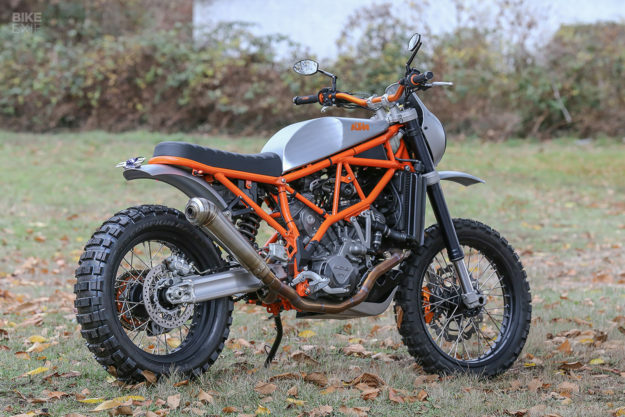 The punchy LC8 series engine delivers 98 hp at the crank in Super Enduro trim, so it was hardly in need of a power boost. But the twin 43mm Keihin carbs get a custom intake system with K&N filters, and Sport-Evolution have freed up the breathing with headers taken from a different LC8 model, hooked up to a modified GPR muffler. 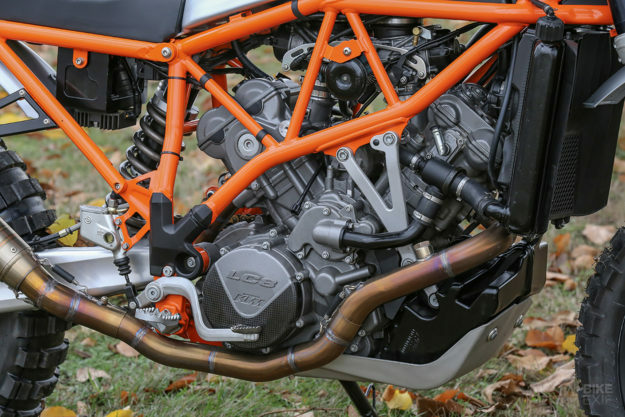 With the power boost and weight drop, we’re betting that top speed will be comfortably over 120 mph (193 kph). 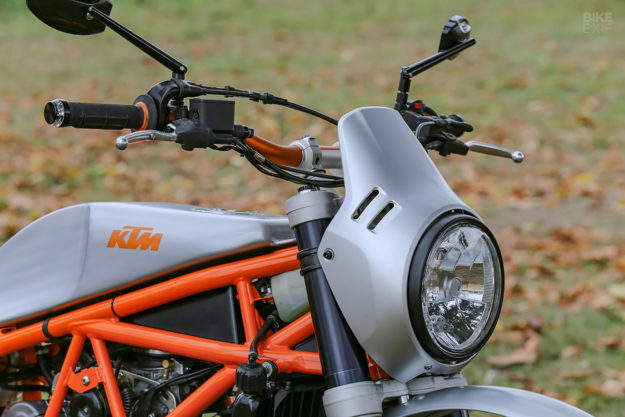 And even a Triumph Scrambler 1200 would probably struggle to keep up with the KTM on fire roads or dusty trails. It’s an unusual mix of funktion and form, with classic custom techniques overlaid on a high-tech base. More of this, please.